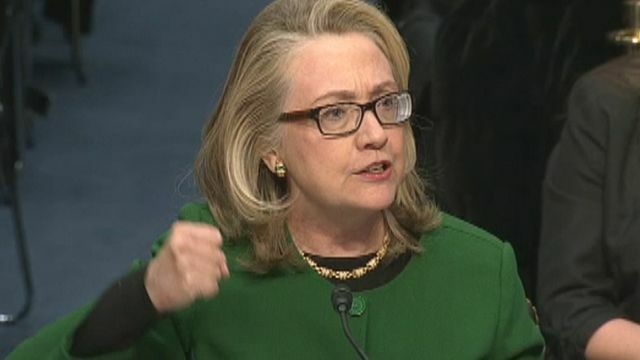 Clinton lashes out at senator over Benghazi questioning - Integration Through Media ....! The secretary is now launching into the second round of testimony before the House Foreign Affairs Committee. Earlier on the Senate side, she pointedly challenged Republican Wisconsin Sen. Ron Johnson when he claimed the department could have “easily” determined what happened that night by interviewing staffers who were evacuated. He was referring to the administration’s initial claim that the attack sprung out of a protest. It was later determined there was no protest on the ground in Benghazi. Diplomatic security agents said as much to the FBI during interviews on Sept. 14, despite administration claims to the contrary two days later. “That was a piece of information that could have been easily — easily — ascertained, within hours if not days,” Johnson said. At that point, Clinton began to raise her voice. “With all due respect, the fact is we had four dead Americans,” she said. Clinton continued to speak, raising her voice and gesturing: “Was it because of a protest or is it because of guys out for a walk one night and they decide they go kill some Americans? Clinton, lowering her voice, then said it is the administration’s job to “figure out what happened” and prevent it from happening again. But Clinton still said the motivations of the attackers, to this day, is not clear. “Even today there are questions being raised,” she said, referring to findings in the classified version of a recent report that she could not describe in detail. The secretary continued to take heat from Republican senators as the hearing proceeded. Sen. Rand Paul, R-Ky., said that if he were president, “I would have relieved you from your post.” He suggested lives could have been saved if she were more involved in reviewing security requests. Sen. John McCain, R-Ariz., after the exchange with Johnson, said he was not satisfied with the secretary’s answers, complaining that the public still doesn’t have answers on what happened. Clinton, throughout the hearing, walked a fine line between taking responsibility generally for what went wrong and challenging specific allegations against her department and the administration. “As I have said many times, I take responsibility, and nobody is more committed to getting this right,” Clinton said, later choking up when describing how she greeted the families of the victims when the caskets were returned. Clinton went on to defend the administration’s actions on the night of Sept. 11, when the U.S. diplomatic compound in Benghazi came under fire and four Americans died. Several accounts relayed to Fox News, though, suggest possible delays in the response. Fox News has learned from senior U.S. defense officials that a FAST team of Marines out of Spain was asked by State Department officials to change out of their Marine uniforms after being asked to leave for Libya to help — this required them to deplane and delayed them by about 90 minutes, according to Pentagon officials. Then there is the decision by Clinton and State Department Undersecretary of Management Patrick Kennedy not to mobilize the Counterterrorism Security Group, which is composed of experts on terrorism from across government agencies and makes recommendations on the response to crises involving terrorism. Further, there are questions about the perceived delays CIA officials — stationed in Benghazi — encountered that night and their frustration that air support was not sent from nearby Sigonella air base. In recent weeks, Fox News has learned that the rescue unit that left Tripoli was told that air support would be above when they landed in Benghazi. It wasn’t. Members of the Special Operations teams sent from Fort Bragg, N.C. and the Commander’s In Extremis Force in nearby Croatia also say they were never given permission to enter Libya, even though some were just a short flight away in Europe. The hearing Wednesday comes amid a broadening threat to U.S. interest across North Africa. There are reports that some of the attackers who took hostages in the deadly raid on an Algeria gas plant may have also participated in the Libya attack. “Benghazi did not happen in a vacuum,” Clinton said Wednesday, while saying later she could not verify that specific claim.She said instability has created an “expanding safe haven for terrorists” who plot into Algeria and other countries. “We know nothing could be further from the truth,” he said. Clinton appeared to agree that the terrorist threat is far from diminished, but said that she never saw the requests from the Libya team for more security. “I didn’t see those requests, they didn’t come to me,” Clinton said.